Early and contemporary architectural iron structures are often a combination of both wrought and cast iron. 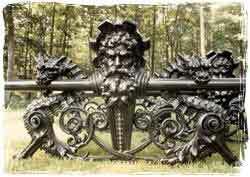 One frequently encounters a cast iron rail with wrought iron elements; or a wrought iron fence decorated with cast iron pieces. This was and is frquently done to combine interest and beauty, with durability and strength...taking advantage of the superior characteristics offered by each type of iron. Realistic representations like the one above can be cast in iron. Lifelike detailing like this would be extremely difficult if not impossible to reproduce in wrought iron. Note the magnificent detail in this impressive ironwork, part of an Architectural Iron restoration done for the Dakota Cooperative in New York City. 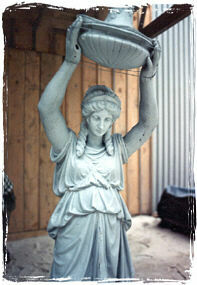 Artistic three dimensional forms like these can be cast by Architectural Iron's skilled craftsman. Forms with internal voids, like the iron radiators of years ago, can also be cast in iron. "Careful consideration of the experience and skill of your contractor should be a required prerequisite to the decision to weld cast iron." "Early" iron structures were made-up of components attached by mechanical joints and fasteners - such as pins, rivets and rivet straps. The structure could be attached to a stone base by "leading" (the use of poured lead), or by packing with solid sulphur. The introduction of welding for attachment - gas welding with oxy-acetylene - wasn't perfected until early in this century. And electrical arc welding is an even more recent development. Welding, while frequently a useful tool, should not, however, be the selected method of attachment in all cases. First, technicial difficulties arise in the welding of cast iron due to it's metallurgical content. It requires not only specialized welding equipment, but a highly skilled welder. When properly done, it can be a cost effective tool. However, when the authenticity of restored eighteenth century iron is a factor, welding could be considered an inappropriate means of attachment.